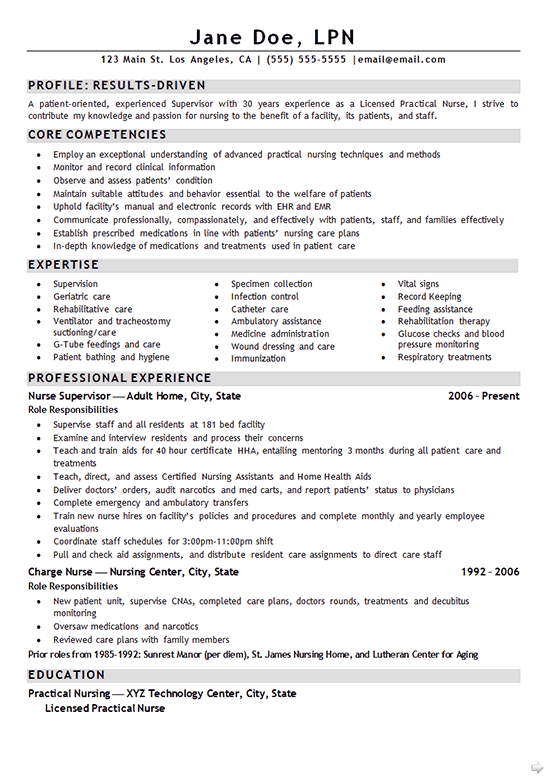 The LPN Resume Example was written for a job seeker that was a 30-year Supervisor in a role as a Licensed Practical Nurse. This nursing professional was looking to move into a more profitable position within her realm of experience. The resume was a challenge because as a longstanding LPN, the candidate had quite a lot of technical knowledge and experience, which needed to be written in an easy-to-read way. It was also pertinent to illustrate the candidate’s evident leadership abilities and the amount of responsibility they had for many years. Combining these valid transferrable management skills alongside medical jargon was done by containing the medical terminology to the Expertise and Areas of Treatment sections. The writer incorporated transferrable achievements and qualities to the Core Competencies section. In addition, while the candidate had held multiple earlier positions in the same field, we narrowed down the Professional Experience section to only the two most recent posts held in order to keep the resume to one page. Evaluate new clients by diagnosing physical condition and health status. Provide basic nursing care and personal care assistance to patients. Record vital signs and chart testing of patients. Assists physicians with examinations, procedures and administrative processes. Maintain medical records of all patient interactions. Ensure patients and families receive a comfortable and therapeutic environment. Help create procedures to assess patients and identify health risks. Deliver health care instructions to patients and family members.